Do you know how high is a 20 foot shipping container? How much cargo can it load? Can you name its main components? You’ll find such information here. In this article, I’ll talk about 20ft container dimensions, weight limitation, buying and leasing, etc. A 20ft container is just simply a cargo shipping container with length of about 20 feet. If you need a rough figures to easily remember, a 20ft container has external length, width, and height of about 20’, 8’, and 8’6” respectively. Those dimensions in meter system are 6.0, 2.4, and 2.6 meters. The minimum internal sizes are 5.9 meter long, 2.3 wide, and 2.4 high. Exact inside figures may vary a little depending on design of manufacturers. As a matter of fact, all those sizes need to be in compliance with the international standard ISO 668:1995. By that way, shipping receptacles can be used smoothly worldwide on different modes of transportation including sea, land, and train (we call such combined activities intermodal transport). For exact dimensions of a 20 foot shipping container in both metric and imperial systems, you can read a separate article about container dimensions. Regarding height, today there are two main types: standard and high container. A standard container is 8’6” in height, while a high is 9’6”. Unlike 40’, containers 20' high cube are less and less commonly used. Most of 20ft containers we see now are standard: 8’6” high. The capacity of a 20 foot shipping container is around 37 cubic meters(cbm). That volume is an approximate rather than an exact figure. That’s because the capacity depends on actual inside dimensions, which are slightly vary as I mentioned above. It should be kept in mind that here we’re talking about container’s inside capacity rather than the cargo volume loadable in a 20ft box. In fact, cargo volume loadable into a container should likely be less due to air space left among cargo packages. That means with a 37 cbm container, you can only stuff less, say 32 cbm of cargo. Refrigerated shipping containers (or Reefer containers) have walls, roof, and ends made of aluminum and reinforced with steel. Aluminum is riveted to internal poles and steel is added to the side rails and end frames. Besides mental parts, several components made of other supplies include plywood floor, plastic placards, rubber door gasket. In addition, industrial paints is needed to coat metal surfaces of containers for beauty and protection purpose. Several visitors to this website asked me how much 20' container weight limit is. Here's the answer: max gross weight of 20’ container is 24 tons including weight of container itself and cargo loaded inside. That limitation is stipulated in ISO 668:1995. Exceeding the such limit may trigger fines, liability claims, equipment damage, and extra costs such as forced transloading. What’s about payload, or net cargo quantity loaded in a 20 foot shipping container? The answer depends on how heavy is the empty container in question. You’re allowed to load as long as gross weight (container + cargo) does not exceed above-mention limit of 24 tons. Let’s take an example. 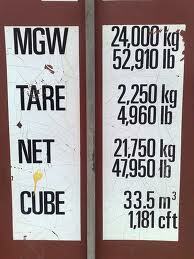 If container’s tare weight is 2,25 tons, then maximum payload is 24-2.25=21.75 tons (see illustration if photo). Some visitors even go further by asking container weight limit in specific countries like South Korea, or Canada. Well, it much depends on regulations of such nations. For instance, in Canada, a 20' dry container can carry maximum 46,000 lbs (20.87 MT) only. In container shipping industry, one of the common terms is TEU, which stands for Twenty-foot Equivalent Unit. It’s worth remembering this is a unit rather than a container. The term denotes space or capacity in equivalent to a 20 foot shipping container. Shipping practitioners use the unit to determine the capacity of container vessels, throughput of terminals, etc. For instance, a container ship with nominal capacity of 8,000 TEU means it has enough space for 8,000 container 20ft. By the same token, a 40ft container is considered 2 TEUs, or in a less common term, 1 FEU (Forty-foot Equivalent Unit). Professional shipping or logistics companies usually place order of hundreds or even thousands of containers of many types (20’, 40’, 45’, refer, flatrack, etc.). With such large contract, they usually go directly tocontainer manufacturers or traders. If you want to buy containers for your own usage like storage, temporary office, or even container house, you need to find out how to buy shipping containers. See more about buy shipping containers. You want to rent a container for some time, e.g. a couple of weeks or a few months? In fact, there a profession of leasing containers, and you may want to read an article about leasing containers. 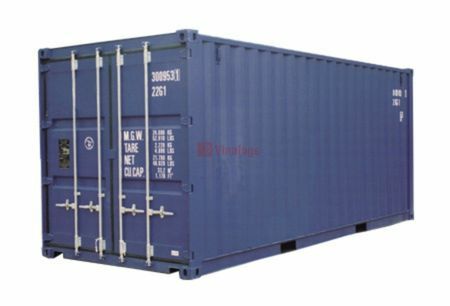 In brief, 20 foot shipping container is a very popular and basic receptacle in shipping world. This article talks about dimensions, weight limitation, buying, and leasing of containers for those working in shipping industry, or those just want to know figure for their own purposes. If you think I should add more information or have comment on this article, please let me know.